Sometimes it’s easy to forget about the most obvious features of a device. In my case, I finally decided to do some investigating about the nature and function of the LAN port on the back of an InFocus 2116. It is not uncommon to see projectors with network access ports these days but I had always assumed that they only worked with the access software that the manufacturer is looking to sell / distribute. 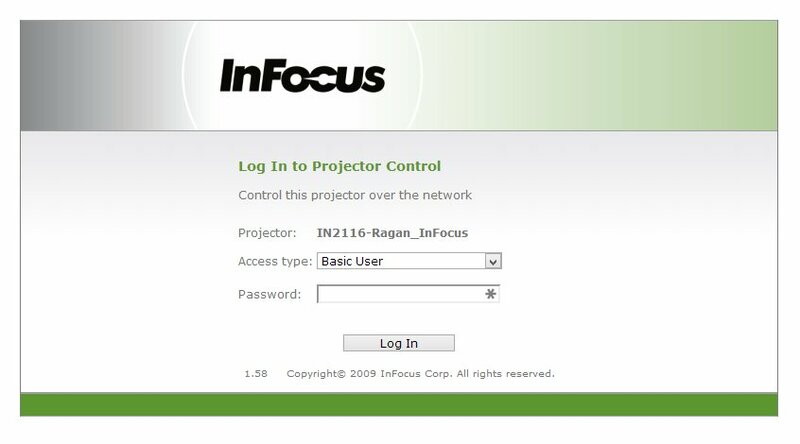 InFocus produces a free piece of software called ProjectorNet ( ) that’s designed to give system admins quick access to the settings and status of connected projectors. 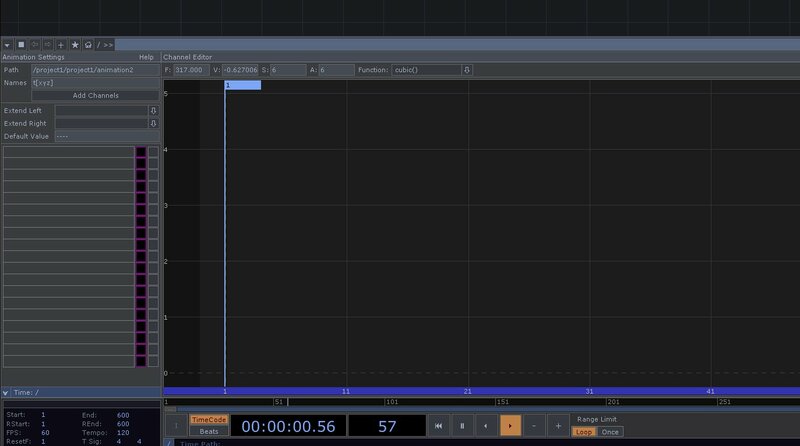 This seems like a handy piece of software, but just wasn’t something I had been in a position to review or experiment with. 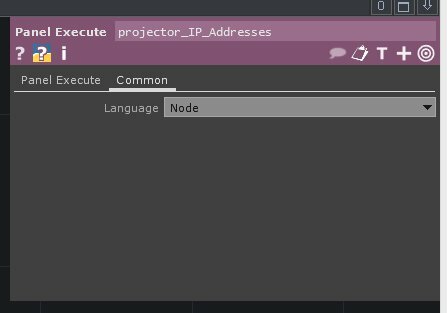 Last week when I finally gave myself some time to look at my LAN options for this InFocus, I noticed something when I booted up the machine – in a rather unassuming way, the projector was listing an IP address on the lamp-up screen. Being the curious type, I decided to see what I got if I pinged the address. I also looked for open ports, and discovered that it was listing for http. Opening up a web browser I decided to try my luck and see what would happen if I just typed in the IP address of the projector itself. I was greeted by a lovely log-in screen for the projector. 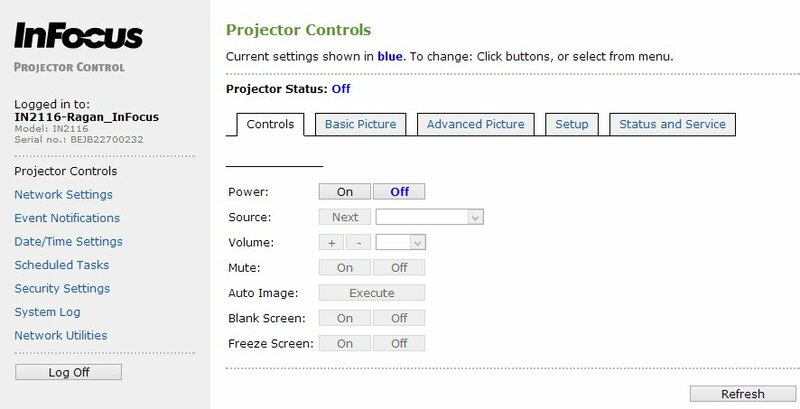 Selecting Administrator from the drop down menu, and leaving the password field blank (I just guessed that the password was either going to be blank or “admin”), I was a shocked to see the holy grail of projector finds. 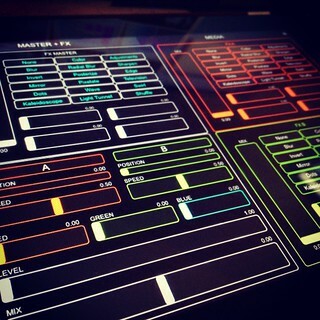 Access to all of the projector’s settings and calibration tools. Jackpot. 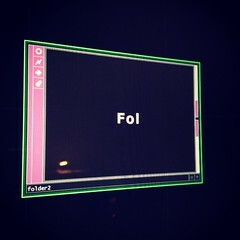 For anyone who has ever been in the unfortunate position of trying to wrangle the menus of a projector, you’ll know how maddening this experience can be – especially if there’s any chance that the previous user might have left the projector in ceiling mode (upside down) or rear-projection mode (backwards). As it turns out, the task of remote wrangling and futzing is in fact something I’ve been wasting time doing. In thinking about how to use this find to my best advantage I started thinking about the production that I’ll be working on in the Spring of 2014 – Wonder Dome. One of the challenges of Wonder Dome is the complex multi-projector installation, calibration, and operation that our team will be working with. 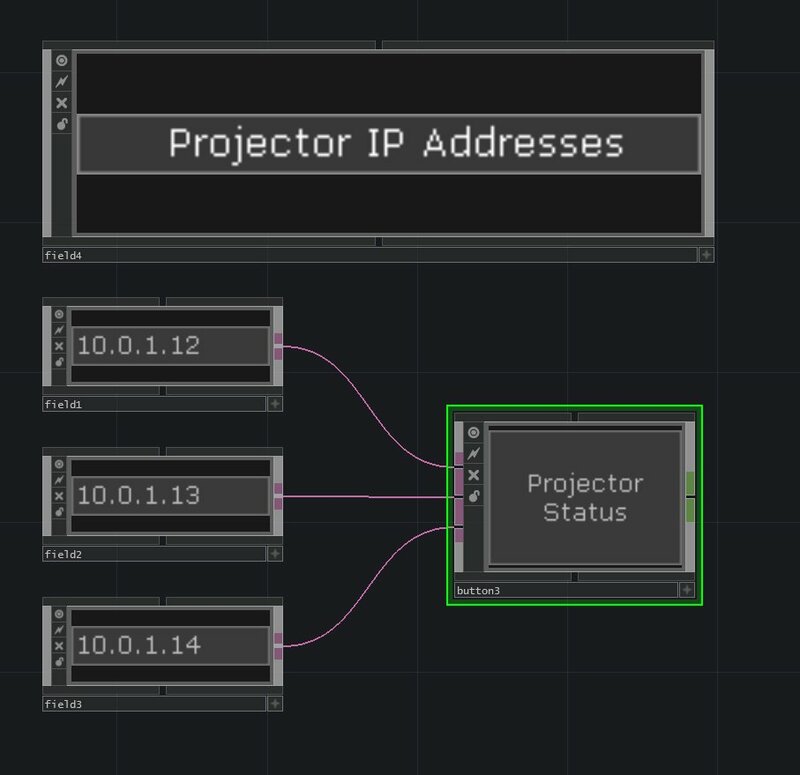 Suddenly having the ability to manage our projection system over the network is a huge win – and a discovery that started me working on the application of this particular find. Here I have four fields where the IP address of the projectors can be entered. 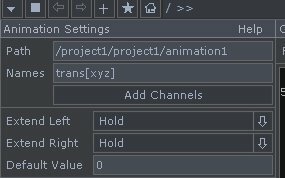 Saving the show file will mean that we’ll only need to do this process once, but also means that if for some reason we swap out a projector, we can easily change the IP address. The Projector Status button opens all three address in separate tabs of my default web browser. Let’s take a look at how to make that work. 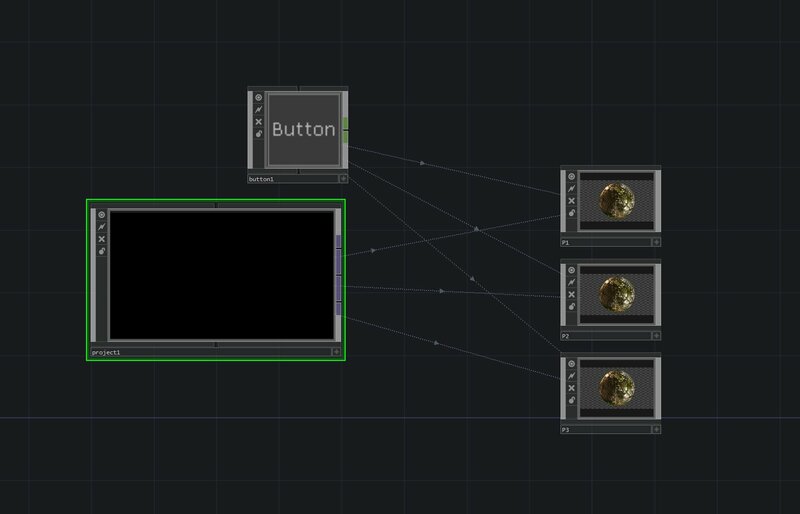 Here I have four Field Components, and a Button Component. 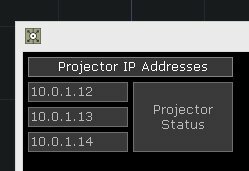 In this particular network I’ve altered one field comp to act as a static label (Projector IP Address), and I’ve altered the button. Turning off the top field was fairly straightforward. 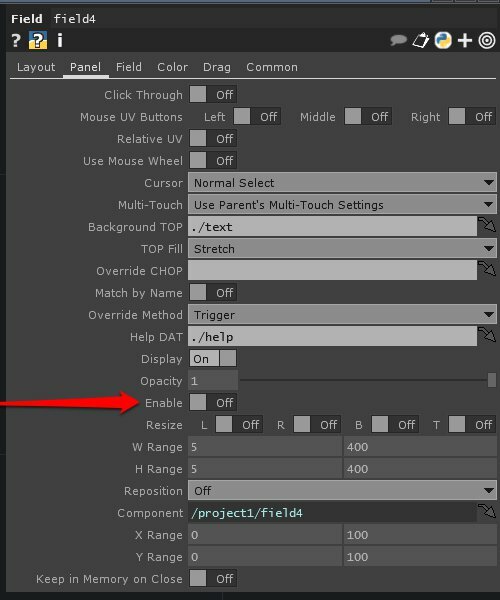 Looking at the Panel page of this Comp you’ll notice a toggle for “Enable.” By setting this parameter to “Off” the panel element is no longer active. 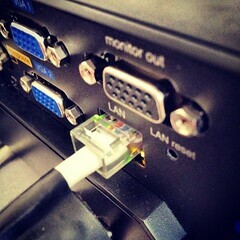 I knew that I wanted the button to pull from three IP address. I started by first adding three field Comps. Next I added my button comp. To pull in the three strings from the field comps I needed to add inputs to the button. Let’s take a look inside of the button comp to see how this works. Other than the usual button ingredients, I’ve added a few other elements. I have three In DATs, one Text DAT, three Substitute DATs, a single Merge DAT, a Null DAT, all ending in a Panel Execute DAT. 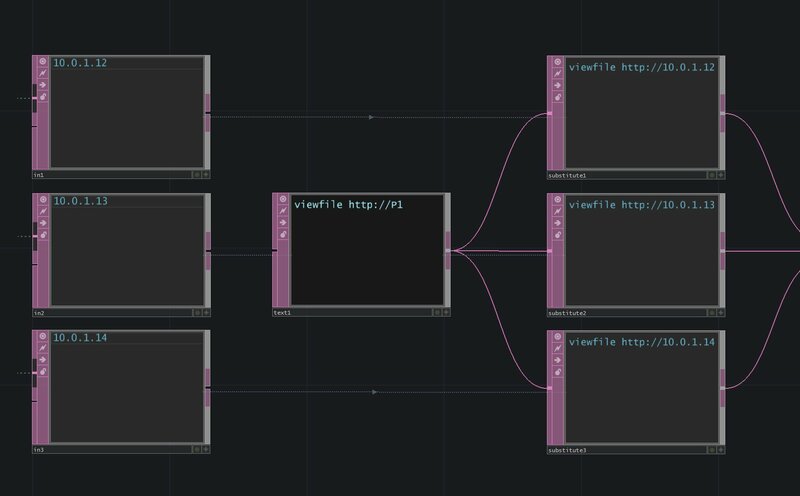 Here the important starting principle is that our Panel Execute DAT needs the following string in order to open our web page “viewfile http://IP_Address_Here“. 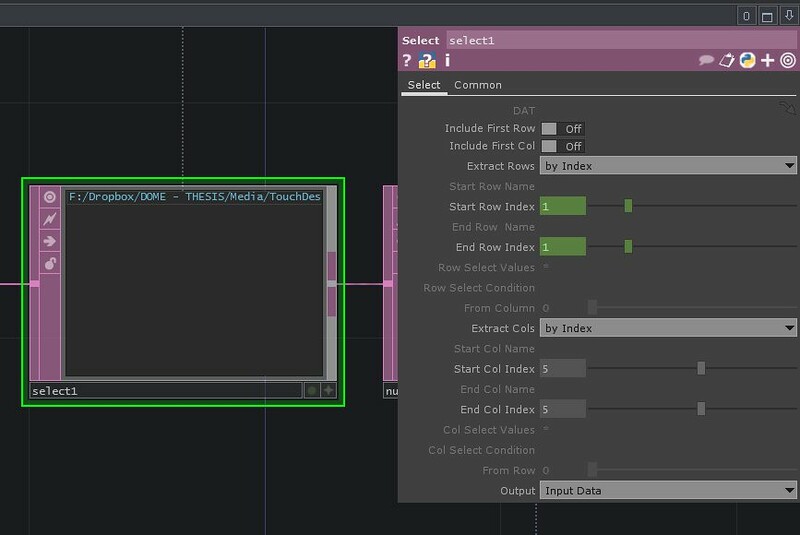 Listing three viewfile commands means that all of those files are opened at once. 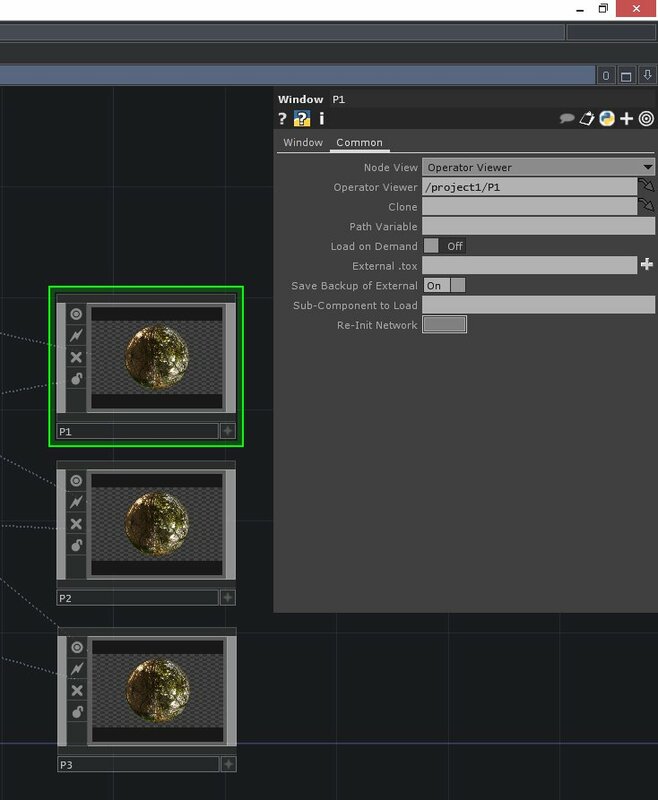 Practically that meant that in order to make this panel command work I needed to correctly format my IP address and add them to the Panel Execute DAT in order to open the three web pages. If we take a look at the format of the In – Text, – Substitute DAT string we’ll see how this works. Here’s how the following DATs work in this network. In DAT – this pulls in the text string entered into the Field Comp. Text DAT – in this DAT I’ve formatted my command for the Execute DAT, with the exception of including a placeholder for the IP address of my projectors. 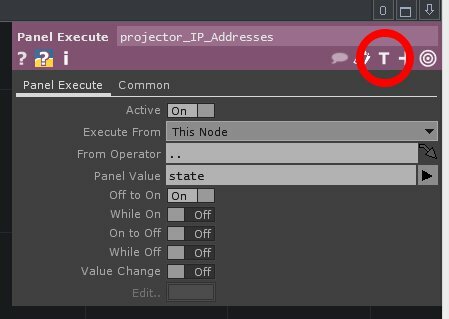 Substitute DAT – the substitute DAT uses the string of my Text DAT, and then removes the placeholder and replaces that value with the IP address of my projectors. 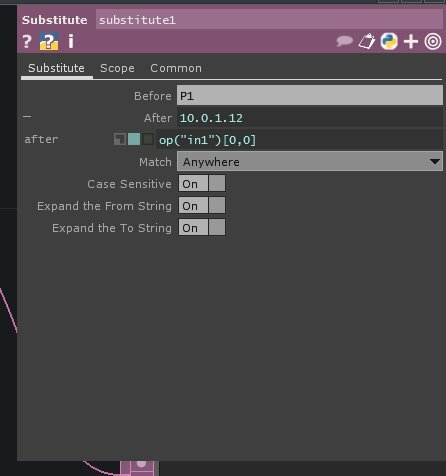 Let’s look at the parameters of the Substitute DAT so we can see how this node works. Here I specified that the term “P1” should be replaced by the contents of the In DAT. 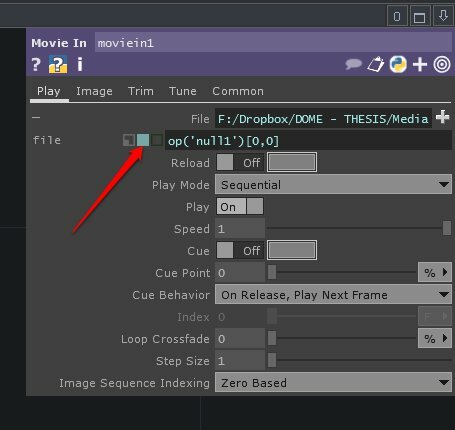 I exported the values of the string with the expression “op(“in1″)[0,0]” which means – in the operator named “in1” pull the contents of the first cell in the first row of the table. 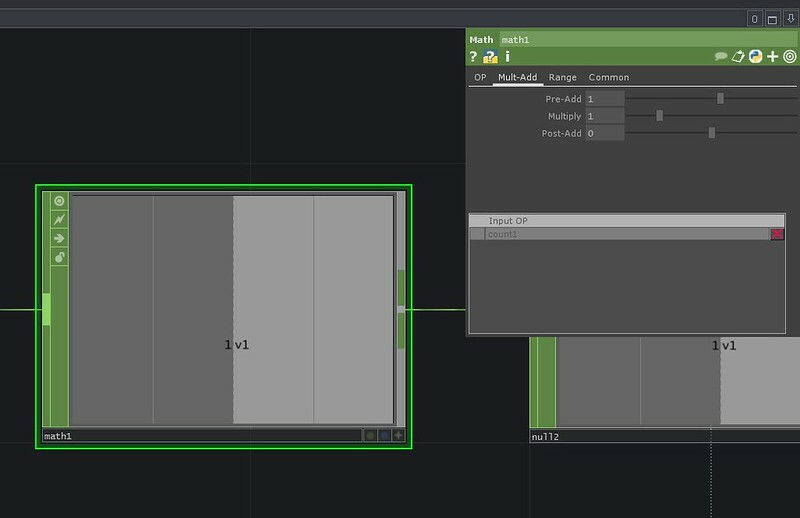 These three Substitute DATs are then combined with a Merge DAT, passed to a Null (just in case I need to make any further modifications at another point), and finally passed into a Panel Execute DAT. Let’s quickly take a closer look at the Panel Execute DAT to make sure that we know exactly what it’s doing. 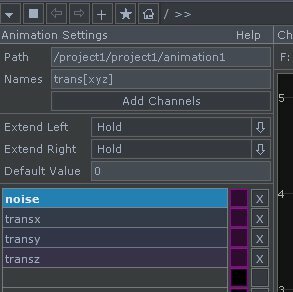 First off we want to make sure that we’re using T-Script for this particular method. You can check this by looking for the “T” in the upper right hand corner of the properties dialog box. We also want to make sure that we force this DAT to stay speaking T-Script. We can do this by bringing up the “Common” page, and selecting “Node” for the language method. Next let’s test this to make sure it’s working. First we’ll move up a level so we can see our button. We’ll make our button something we can interact with by clicking on the View Active button in the bottom right hand corner (it’s the button that looks like a + sign). Now we should be able to click our button which should in turn launch three browser windows. Bingo, bango our button now opens up three tabs in Chrome. If you need some more information about working with buttons in general you can do some more reading here. 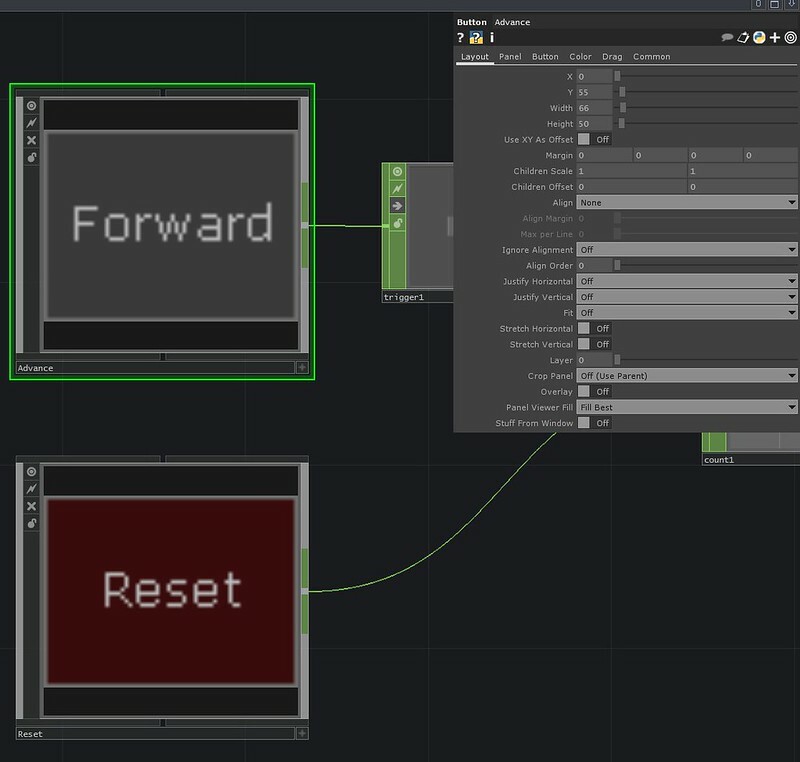 This entry was posted in How-To, Live Performance, media design, Programming, Software, TouchDesigner and tagged Arizona, Arizona State University, ASU, media design, programming, TouchDesigner, TouchDesigner Tutorial on December 21, 2013 by raganmd. 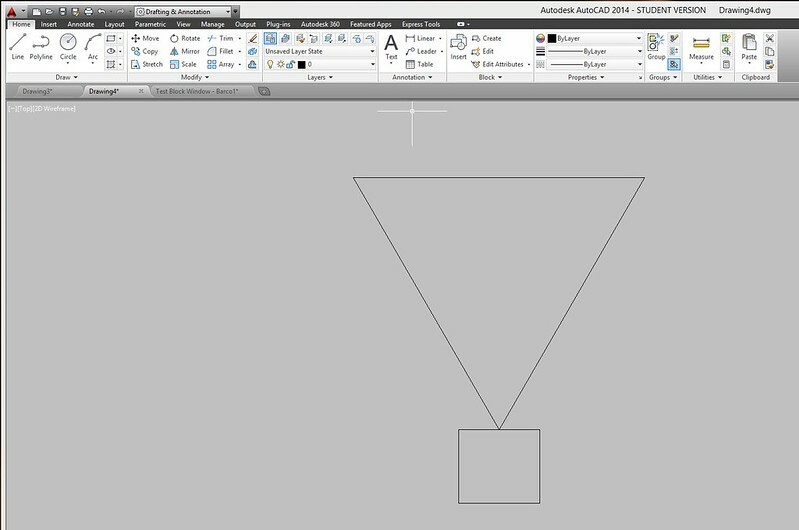 This semester (Fall 2013) I decided to take an AutoCAD course taught by ASU’s Jennifer Setlow. 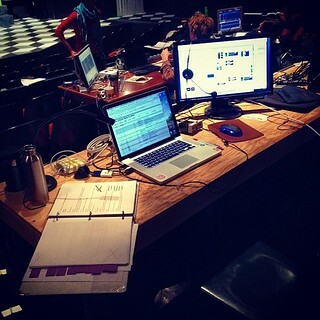 Jen’s course is primarily designed to serve lighting and scenic designers. 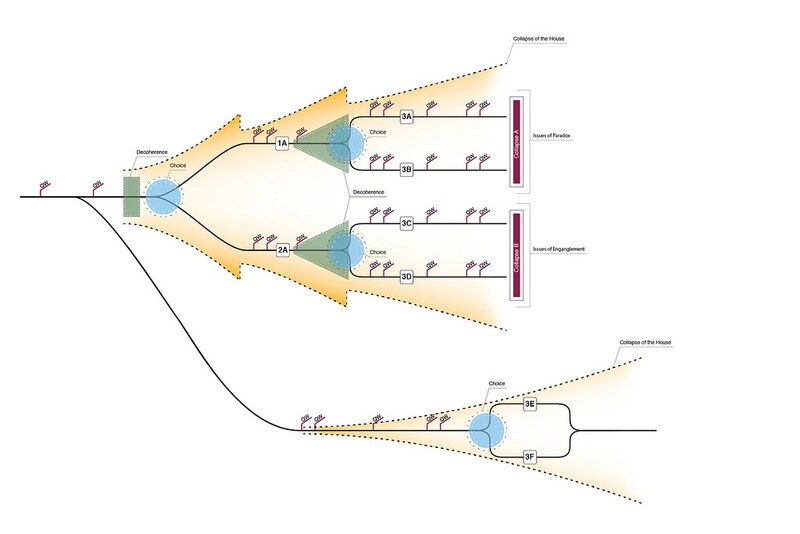 That said, it’s already proven to be an invaluable experience for a media designer as it’s exposed me many of the models and methods that a lighting designer would use when creating a lighting plot. As a final project Jen asked that students identify a project that would be challenging intellectually and technically. Ideally, this project would also be useful to the student in some capacity that reaches beyond the classroom itself. With that in mind, as a final project I’ve opted to create drawings of the projectors that we keep in stock at ASU. in addition to detail drawings of the projectors themselves, I also want to create a set of dynamic properties that allow the designer to visualize the throw distance of the projectors when placed in a drafting of the theatre. 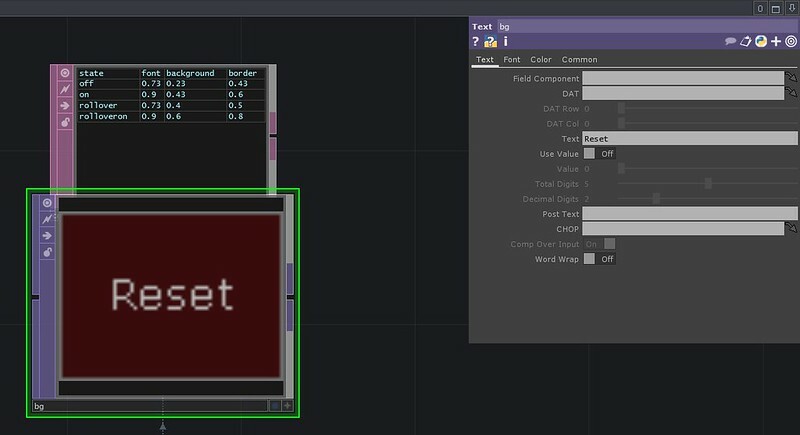 My hope is that this will allow for easier plotting and planning not only for myself but for future designers. 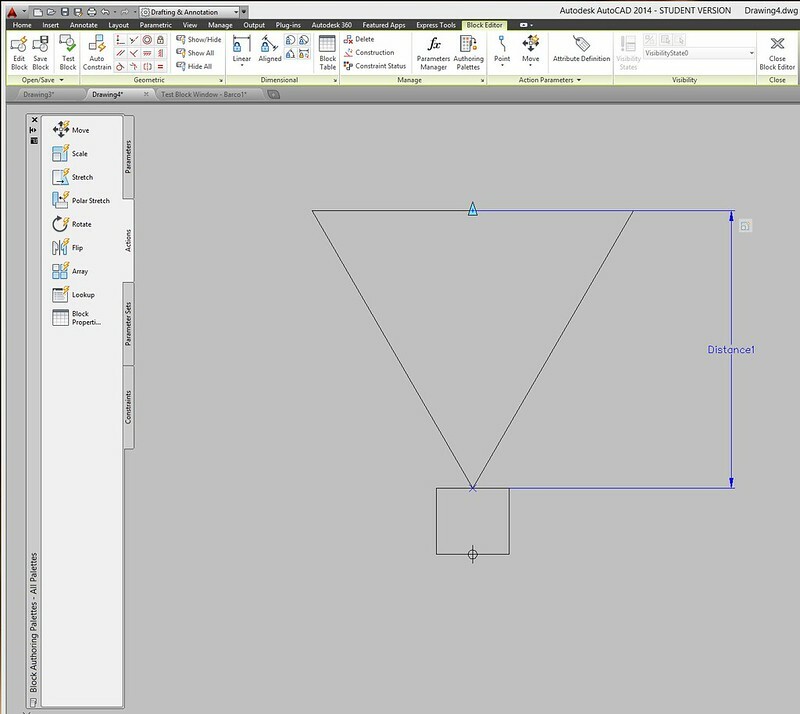 One of the problems to consider here is how to dynamically resize a portion of a block in a drawing based on another changing property of the block. 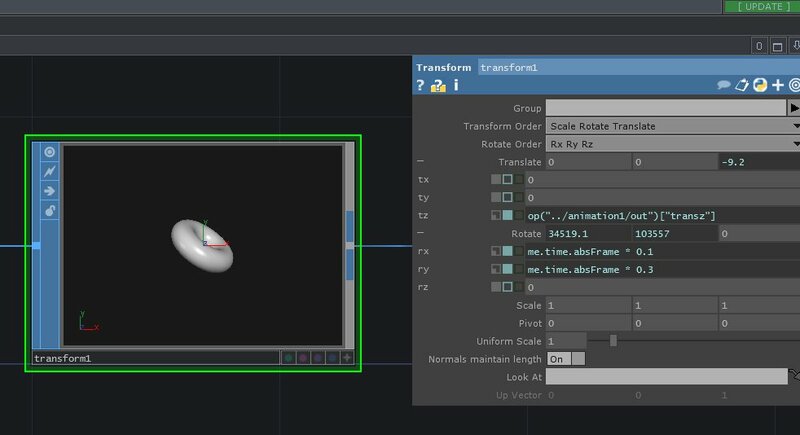 In other words I want to be able to shift the shape of the cone of the projector based dragging a the dynamic handle of a drawing. 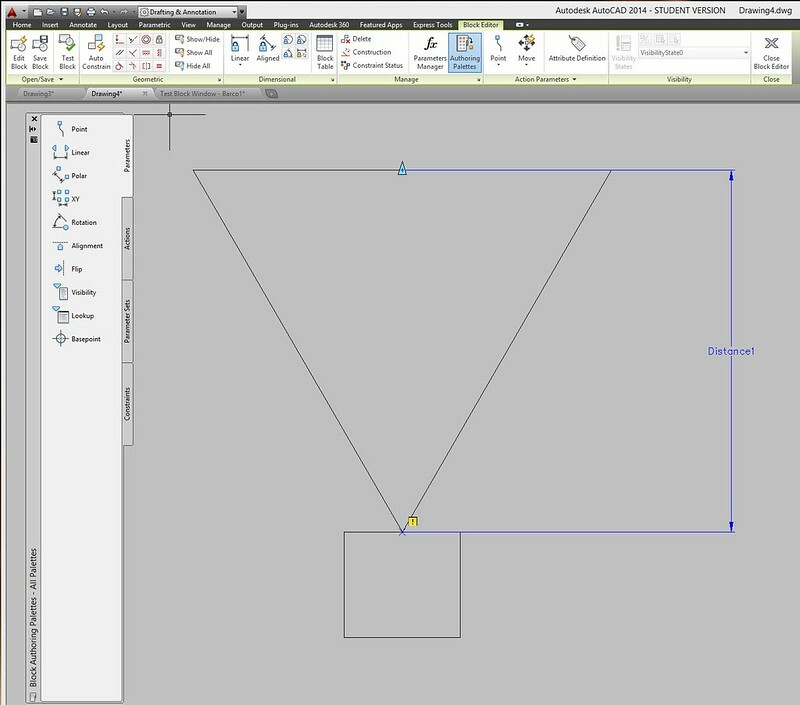 We can solve this problem with a little bit of digging on the Internet, and some careful work in AutoCAD. 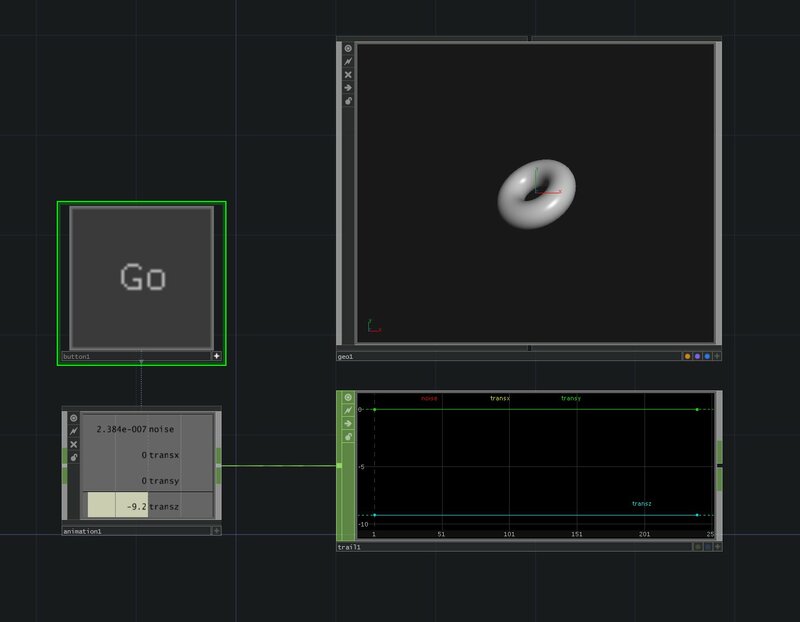 My initial starting point was to look at a helpful video from CAD Masters (you can see the whole channel here). For the sake of this process, I’m going to focus on a simple implementation of this particular concept. To get started on this we first have to create a new drawing. 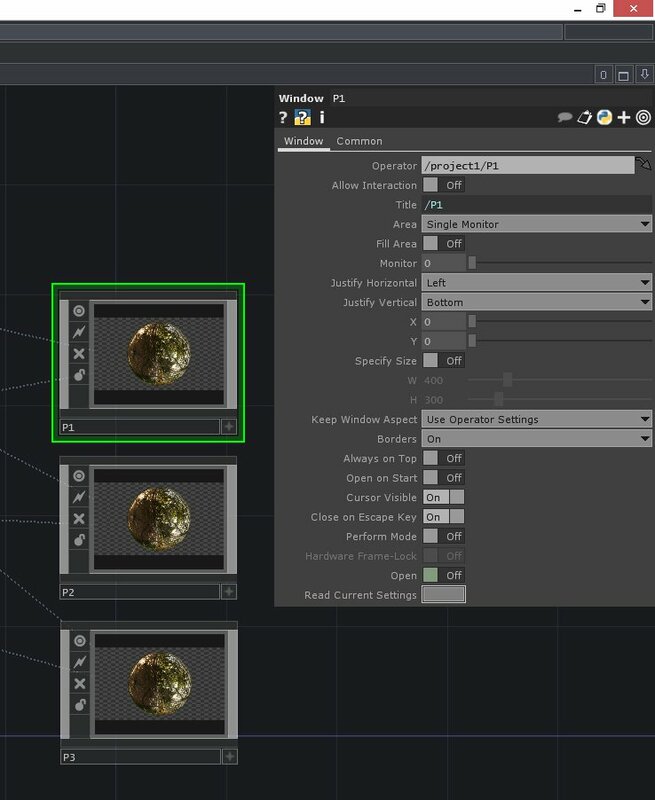 With our new drawing created we need to add a few features that we can use. 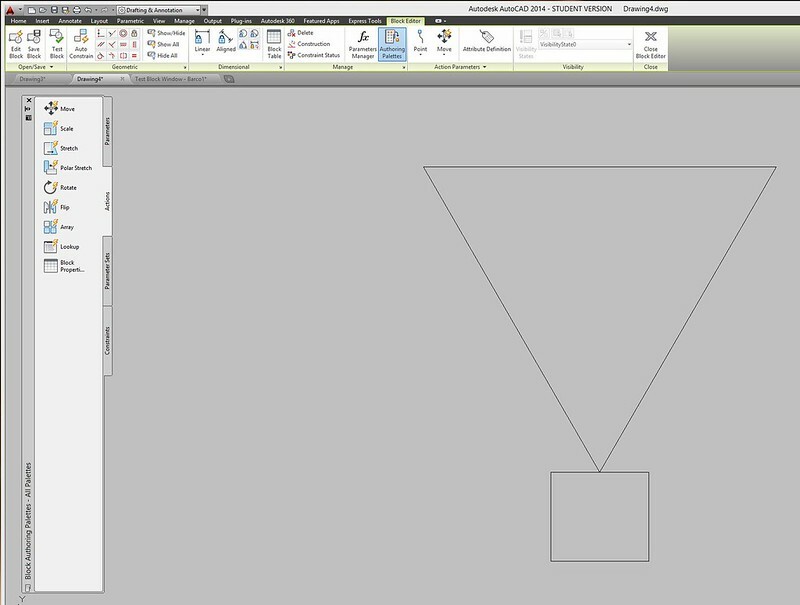 Lets start by making a rectangle, and a triangle (to represent our projection cone). Next I’m going to convert this shape to a block. First I’ll select the whole object, then type “Block” into my command line. 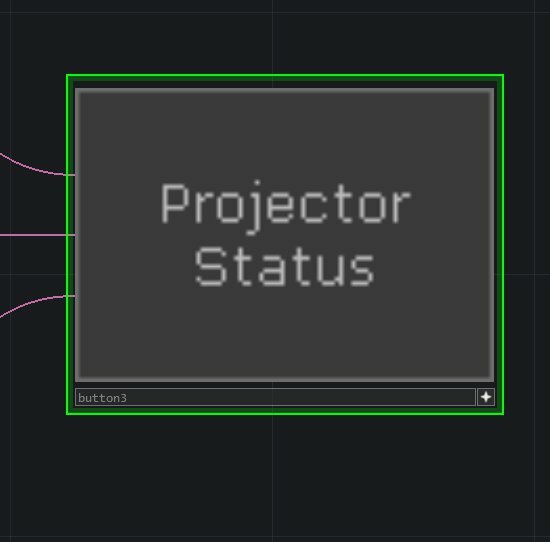 This will open the our new bock in the Block Editor where we can make some of the more interesting changes to our projector. 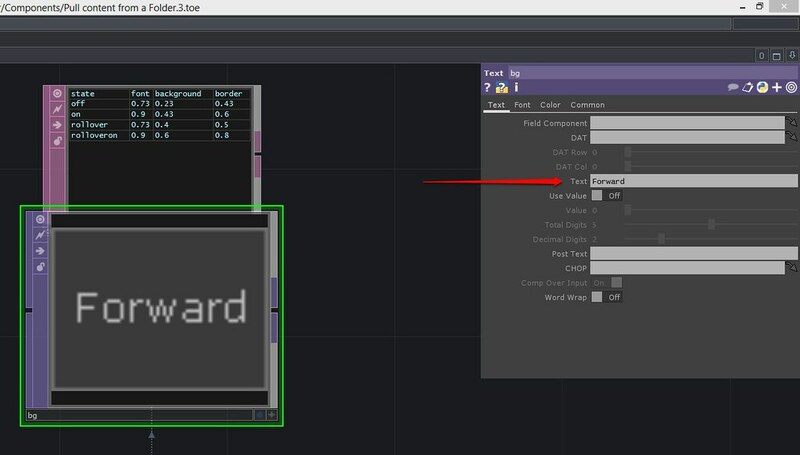 In the Block Editor we have a new contextual ribbon, and a new pallet (the Block Authoring Palettes). 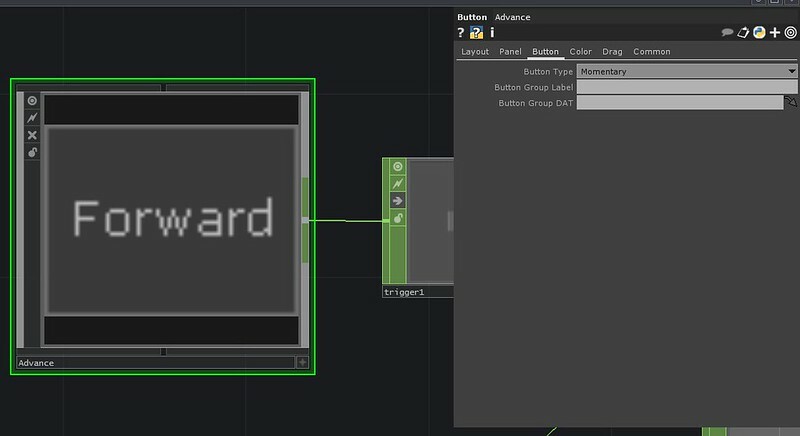 Here in the block editor we’re going to use a linear parameter as a handle. 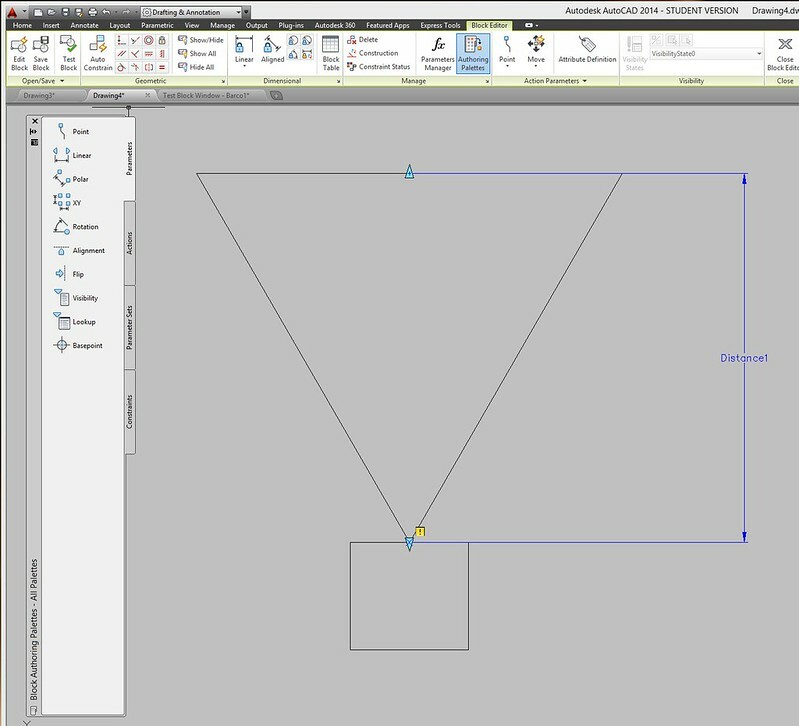 Let’s place this parameter coming out of the center point of our cone. 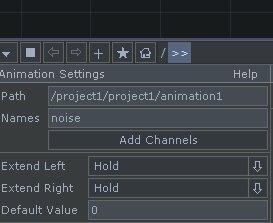 I only one a single handle on this parameter, so I’m going to click on the bottom blue arrow, and his the delete key to delete just that handle. 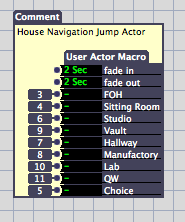 Next I’m going to associate an action with this parameter. 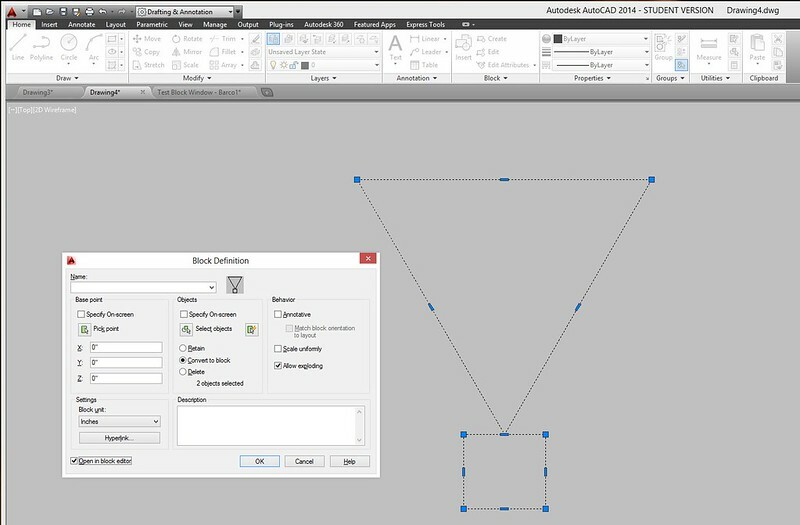 From the Actions tab on the Block Authoring Palette, I’m going to select “Scale.” After this I’ll first select my parameter, and then my object to scale (in this case the triangle) and hit enter. Finally I’ll click on “Test Block” in my ribbon to see if this block is working the way I had expected. For now this is pretty close. Coming up, how to dynamically see zoom and lens shift. 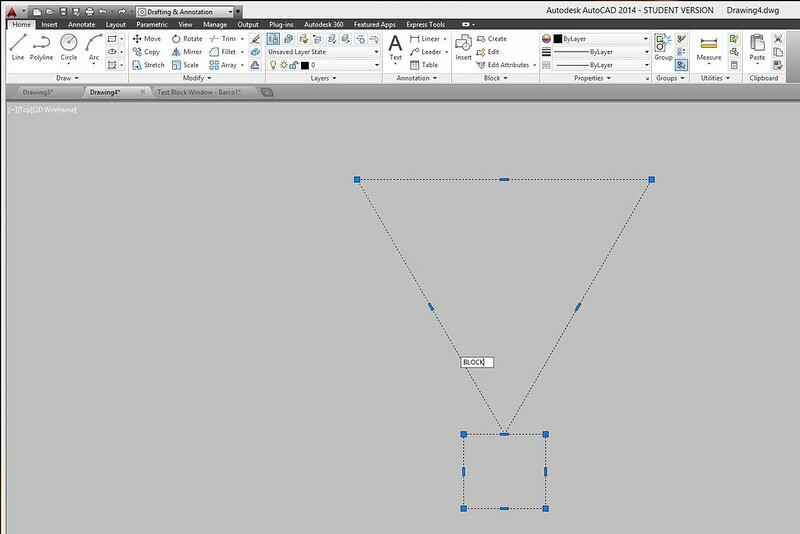 This entry was posted in Class, media design and tagged Arizona State University, ASU, AutoCAD, Grad School, graduate school, media design on November 11, 2013 by raganmd. This coming year at ASU I’ll be working on a project with several talented artists and media Makers on a project that’s tentatively being called “WonderDome.” As Dan Fine’s thesis project he’s exploring what it means to create a playing space that exists inside of a dome of projection. The audience and performer will share a single immersive media environment where a story will be told with puppets, video, and just about all the theatre magic you can imagine. Central to this endeavor are questions about immersive media systems and how to approach the complex issue of mesh warping media for a curved surface that’s being ditched together with somewhere between six to eight projectors. The traditional approach for this kind project would be to make the flat media first. 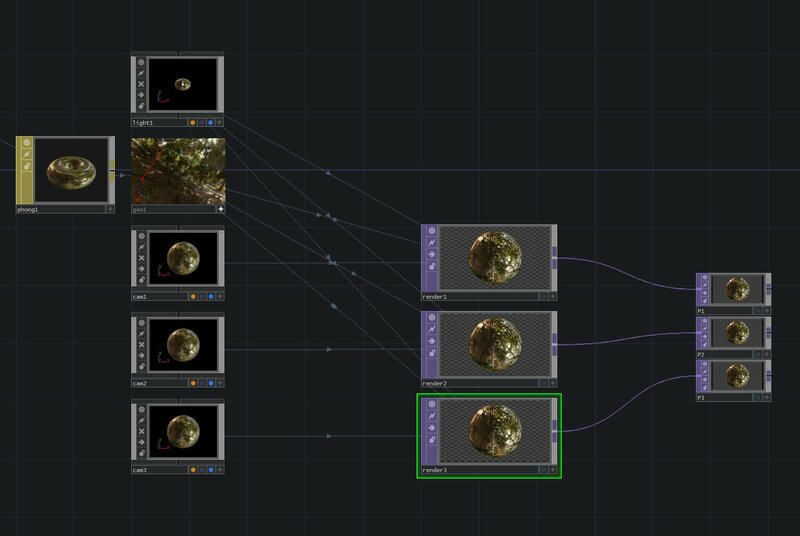 After creating the structure, and installing the projectors we’d create a sample mesh-warped After Effects Comp and ultimately run all of our flat media through that comp to split it up into several pieces with the appropriate distortion applied. While that’s certainly a tried and true method it doesn’t leave much room for error, and it also makes it difficult to use live video. On our wish-list of media systems is a d3 media server by d3technologies. While their systems may well be out our price range, their approach is one that’s gaining traction in smaller projection circles. 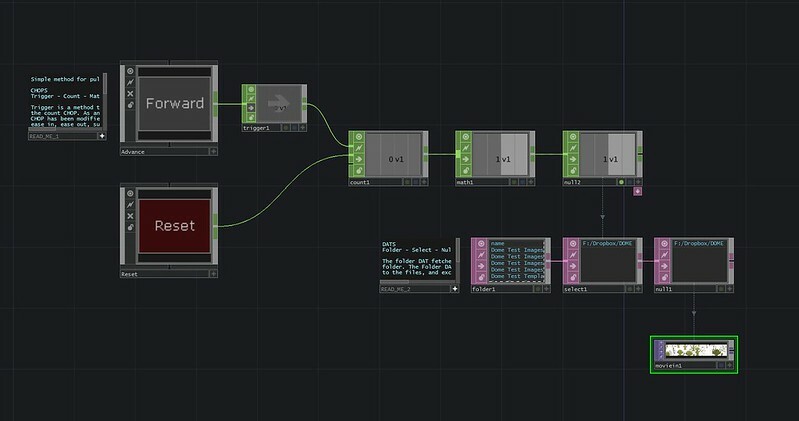 We can pull apart some of the same process by working with Derivative’s TouchDesigner to get a sense of how we may well be thinking of projection mapping in the not too distant future. Instead of waiting to get onsite, or crafting media specially fit for a particular structure, we instead start with a 3D model. 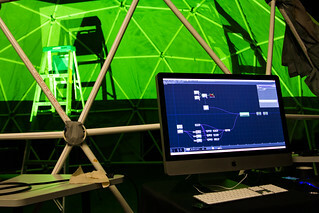 In our computer generated model we add projectors, lights, paint our surfaces with textures or video, effectively assembling our system virtually. 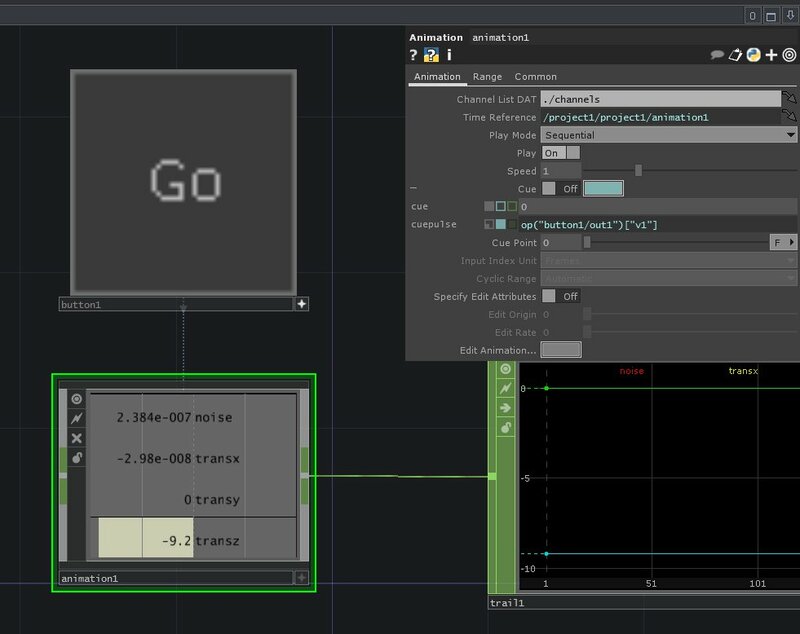 The videos below take a quick and rough look at what this kind of workflow looks like in TouchDesigner, and how it differs from the kind of projection mapping you may already be accustomed to. 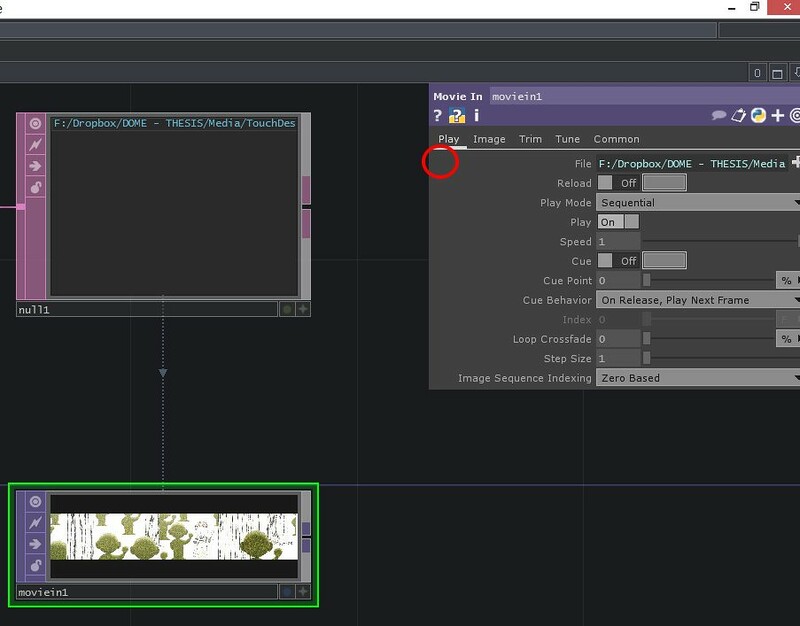 This entry was posted in How-To, media design, Programming, Software, TouchDesigner and tagged ASU, Grad School, immersive media, media design, technology, TouchDesigner, TouchDesigner Tutorial on July 24, 2013 by raganmd. In December of 2012 I was approached at an ASU School of Theatre and Film party and asked if I would be interested in working on a project that would begin the following semester, and premiere a new work in the Fall of 2013. As this is exactly the kind of opportunity that I came to ASU to peruse, I eagerly agreed to be a part of the project. The latest cohort of actors, designers, and directors started in the Fall of 2011, which means that the group is due to graduate in the Spring of 2013. In both the second and third year of the cohort’s program they work to create a newly devised piece that’s performed in one of the theatre’s on campus as ASU. Occasionally, this group also needs a media designer, and it’s their new show for 2014 that I was asked to be a part of. Our devising process started with some source material that we used as the preliminary research to start our discussion about what show we wanted to make. Our source materials were Edgar Allen Poe’s The Fall of the House of Usher, M.C Escher, and Quantum Mechanics. With these three pillars as our starting point we dove into questions of how to tackle these issues, tell an interesting story, and work to meet creative needs of the group. 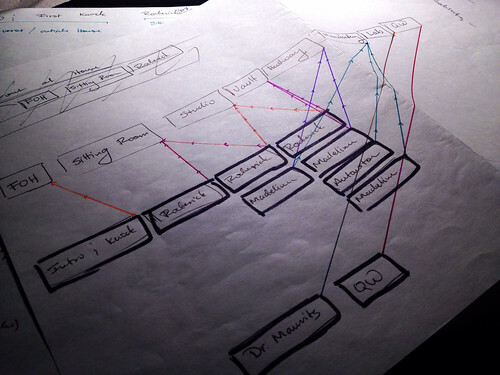 One of our first decisions focused on the structure of show that we wanted to create. After a significant amount of discussion we finally settled on tackling a Choose Your Own Adventure (CYOA) kind of structure. This partially arose as a means of exploring how to more fully integrate the audience experience with the live performance. While it also brought significant design limitations and challenges, it ultimately was the methodology the group decided to tackle. Shortly after this we also settled on a story as a framework for our production. Much of our exploratory conversation revolved around the original Poe work, and it was soon clear that the arc of the Fall of the House of Usher would be central to the story we set out to tell. 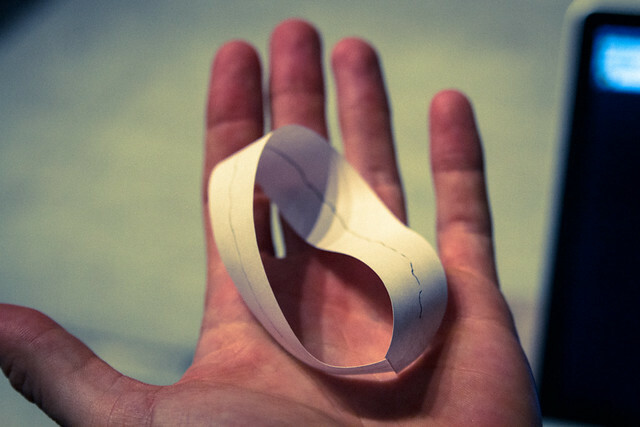 The wrinkle in this simple idea came as our conversations time and again came back to how Poe and Quantum Mechanics connect with one another. As we talked about parallel universes, and the problems of uncertainty, we decided to take those very conversations as a cue for what direction to head with the production. While one version of the CYOA model takes patrons on the traditional track of Poe’s gothic story, audience members are also free to send our narrator down different dark paths to explore what else might be lurking in the Usher’s uncanny home. Looking at the photo below you can see where the audience has an opportunity to choose a new direction, and how that impacts the rest of the show. While this was a fine starting point, we also realized that it only giving the audience an opportunity to explore one avenue of possibility in the house felt a little flat. To address that point we discussed a repeated journey through the house in a Ground Hog Day-esque repeated style. Each run of the show will send the audience through the CYOA section three times, allowing them the opportunity to see the other dark corners of the house, and learn more about the strange inhabitants of the home. 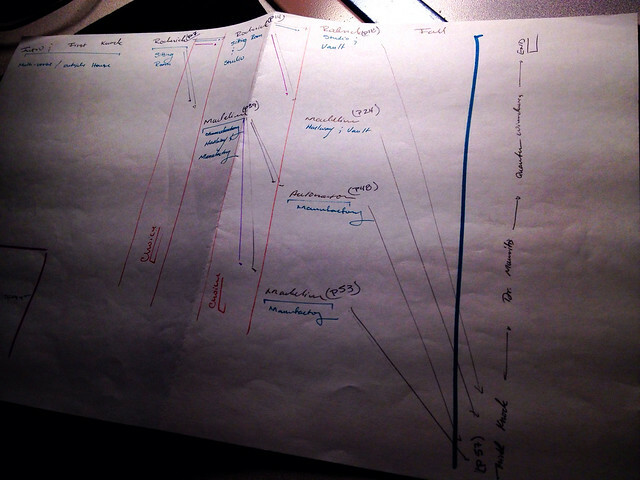 I did a little bit of map-making and mapped out all of the possible paths for our production; that is, what are all of the possible permutations of the three legged journey through the house. 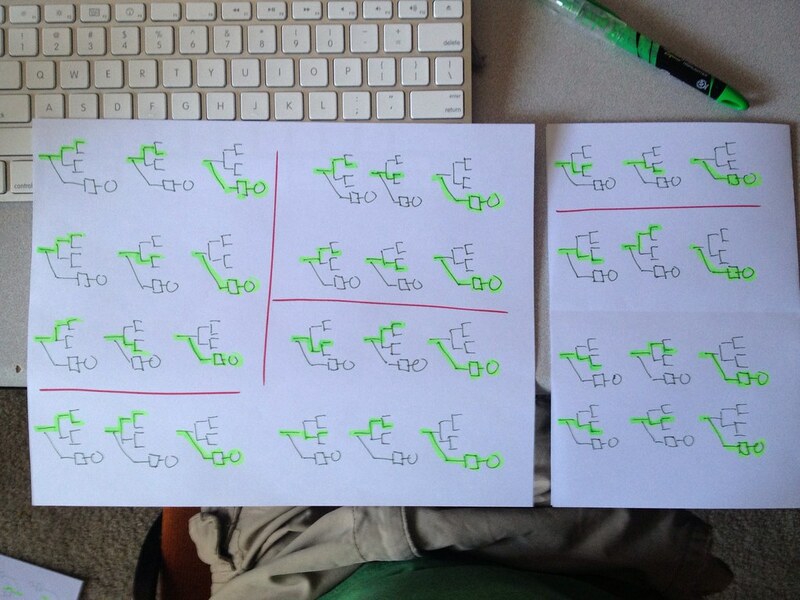 The resulting map means that there are twelve different possible variations for the production. A challenge, to be sure. So what’s media’s role in this production? The house is characterized by it’s Escher patterned qualities. Impossible architecture and tricks of lighting and perspective create a place that is uncanny, patterned, but also somehow strangely captivating. Just when it seems like the house has shared all of it’s secrets there are little quantum blips and pulses that help us remember that things are somehow not right until ultimately the house collapses. Our host (who spends his/her time slipping between the slices of the various paths the audience tumbles through) is caught as a destabilized field of particles only sometimes coalesced. The culminating scene is set in a place beyond the normal, a world of quantum weirdness – small as the inside of an atom, and vast as the universe itself. it’s a world of particles and waves, a tumbling peak inside of the macro and micro realities of our world that are either too big or too small for us to understand on a daily basis. Media’s role is to help make these worlds, and to help tell a story grounded in Poe’s original, but transformed by a madcap group of graduate students fighting their way out of a their own quantum entanglement. This entry was posted in production and tagged Live Performance, media design on May 21, 2013 by raganmd.